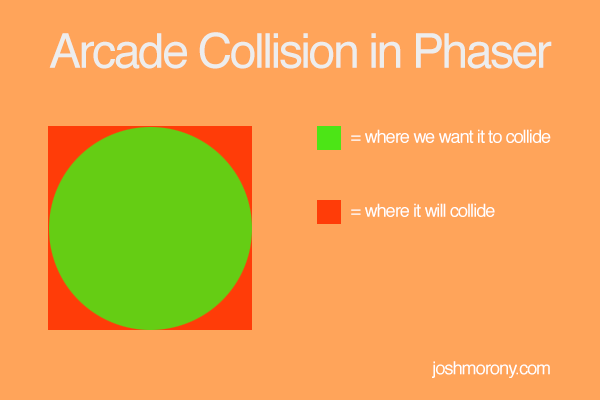 In a game this would mean that a collision could occur even if the circle is not colliding with anything. Circles are a bit of an unfortunate example, but in most cases this collision detection works well and will look fine. P2 Physics is a much more complex and realistic physics system. Using P2 you could create things like springs, pendulums, motors and so on – the only real downside to using this system is that it’s much more “expensive” and can put a strain on resources. Using P2 physics on a mobile device would not work as well as Arcade Or Ninja would. That’s a very brief summary of the different types of physics systems you can use in Phaser (there’s also another commercial physics system, Box2D). You can even use different physics systems together, as I mentioned P2 is the most “expensive” physics system, but you could design your game to use Arcade Physics mostly, and only use P2 where required. In the rest of this tutorial we are going to look at how you can get Ninja Physics set up in your game (it’s not quite as easy as you might think). Ninja Physics is no longer included in the build files by default. Not enough people were using it, and not enough contributions were coming in to help polish it up, so we've saved the space and removed it. It's still available in the grunt build files if you require it, but we're deprecating it from the core library at this time. It will make a return in Phaser3 when we move to a modular class system. So we will need to create a version of the Phaser library with Ninja Physics included from the source code by using Grunt. To do this we will need to clone the Phaser repository locally and then run a command to build it. Before you can do that you will need to make sure you have git and Node.js set up on your machine. Once you have those set up, or if you do already, you can follow the rest of these steps. NOTE: If you’re from the future and you are viewing this post, Ninja Physics may be included by default now. So before doing all of this, check if Ninja Physics is available or not. Alternatively, if you don’t feel like doing all of this you can grab a copy of Phaser v2.4.2 with Ninja Physics that I compiled here. If you don’t know what Grunt is, you can check out the website here. Essentially, it’s a tool for running automated tasks. and that’s it! I’ll be writing a tutorial very shortly that expands upon my Arcade Physics based running platformer tutorial to use the Ninja Physics system instead so keep an eye out for that! UPDATE: The Ninja Physics Game Tutorial is out now.